With the help of my colleague David Flanigan, an organic chemistry professor and fellow reef aquarist, I tested the effectiveness of some reflectors used with T-5 fluorescent bulbs in aquarium lighting fixtures. We knew that any sort of reflector in a fixture would help send more light downward into a tank, but we wanted to see some hard data, and wanted to compare a couple of different types of reflectors in the process. So, we set up a test tank, got a light meter and a couple of fixtures, and got to work. To start, we cut up and marked some eggcrate, attached it to a PVC frame we built (along with uprights of different lengths that could be switched out to take readings at different depths), and got a light meter. We went with the Apogee Instruments Quantum Meter with a cabled sensor, after reading Riddle (2005 & 2008) and talking to lighting expert Sanjay Joshi. This meter measures PAR (Photosynthetically Active Radiation), the important part of the spectrum for organisms that use light, which is also called PPFD (Photosynthetic Photon Flux Denisty). It does this, and then reports intensity in units called micro-Einsteins per square meter per second (µE·m²·sec) or micro-Mol per square meter per second (µMol·m²·sec). Riddle (2008) covers this in more detail, so give it a read if you like. There are numerous pre-fabricated T-5 fixtures available, and all that I’ve seen have some sort of reflector included. However, some fixtures have a single reflector that’s typically a flat or curved sheet of polished aluminum mounted above all the bulbs in the fixture, while many others have a single, smaller aluminum reflector for each individual bulb. These tend to wrap around half of the bulb and have some number of bends/folds in the aluminum. So, we got one of each type of fixture and tested both. During our tests, we made some other discoveries, quite on accident, and I want to go over a couple of these first, though. While some aquarists might leave the back of their tank alone, or may cover it with a sheet of colored plastic, it’s common practice to tape up the sides and top of a new tank and spray paint the back of it blue or black. However, one of the accidental discoveries we made was that this can significantly reduce the amount of light that is reflected into a tank. 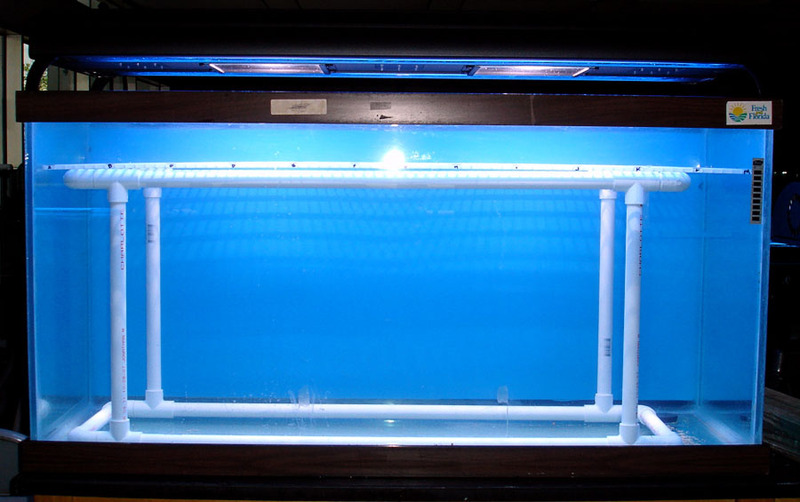 Our test tank was a 95 gallon tank with dimensions of 24″ high x 18″ wide x 48″ long, as this is a popular footprint, and we did much of our testing with the tank full of water after we found that this can also make a significant difference in readings. The tank was also painted light blue on the backside. Like those of many hobbyists, our test tank had a painted blue background. When we started testing, we assumed that light readings would always be lower at the front of the tank and higher at the back. 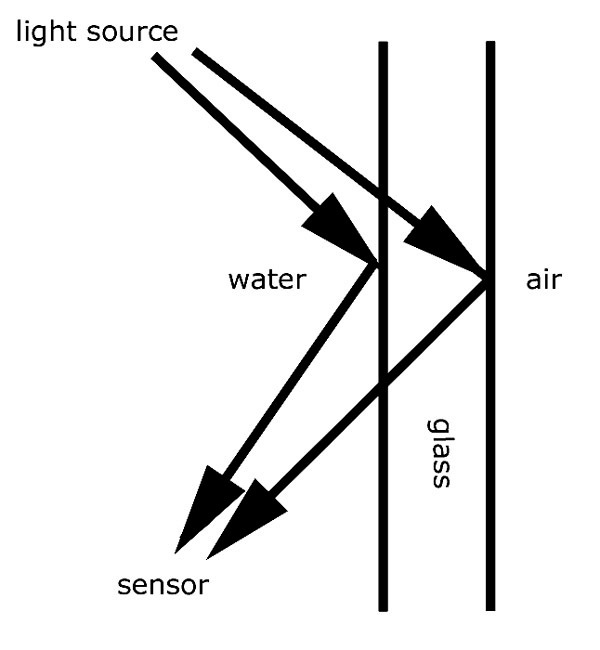 The reasoning was that some of the light from the bulbs should be reflected off the front pane of glass back into the tank and off the rear pane of glass into the tank – but that more light would “escape” through the clear front pane, while more would be reflected back in from the painted back pane. However, were wrong, as the readings at the front of the tank, without exception, were higher instead of lower than those at the back of the tank. To develop an understanding of why this happened, look at the lighting “footprint” below of our TX5 48″ fixture that houses five 48″ T-5 bulbs, which was generously donated by Aquactinics. The units are PAR (as µMol·m²·sec) measured in the tank with the sensor at 10″ water depth, and note that the front of the tank is at the bottom of the figure. Average PAR at the front of the tank was calculated by adding the 11 readings taken at approximately 1″ from the front pane of glass during each test and dividing that sum by the number of readings taken (11). Notice that the light intensity was lower at the back of the tank where the average was 167 µMol·m²·sec (top of the footprint), and higher at the front where the average was 234 µMol·m²·sec (bottom of the footprint). We found that the same thing happened when we later tested our Nova Extreme fixture that houses four 48″ T-5 bulbs, our Orbit fixture that houses four 21″ PowerCompact bulbs, and even our Outer Orbit fixture that houses four 48″ T-5 bulbs and two 150w DE metal halide bulbs (all of which were generously donated by Current USA). For some reason the painted blue background, without exception, made the back of the tank darker than the front. It occurred to us that we could take a look at the effect a colored plastic background would have on readings. So, we tightly taped a blue plastic background to the front of the tank to see if the readings would then equal those at the back. The background material we had was about the same color blue as the paint on the back of the tank, so we thought that’s what would happen. Wrong again. Let’s look at the new footprint, again with the TX5 fixture and everything else the same except for the addition of the plastic sheet. Well, it looks the same. The readings were essentially the same as before, being ever so slightly higher at the front of the tank. Apparently it was something about the paint itself, rather having something blue on the front/back of the tank. So, just for the fun of it we tried a black plastic background. It didn’t really change the readings, either. Thus, it seemed that the color of the plastic sheer didn’t matter. The front was still brighter than the back. Then Dave had a great idea. Next, we tried the blue plastic background again, but this time we wetted the glass on the front of the tank, stuck the plastic to it and then pushed all the air bubbles out from underneath it. Basically our simulated painted background looked just like the real painted background, and was stuck onto the pane itself with no air in between the plastic and the glass. This time we got something totally different, as you can see on the new footprint. Oddly enough, the readings at the front mirrored those of the back of the tank. Note that the average PAR at the front of the tank is approximately 30% lower than it was when we started, and is essentially identical to the readings along the back (an average of 166.6 µMol·m²·sec for the back vs. 166.9 µMol·m²·sec for the front)! Okay, so we did one more. Next, we wetted the front of the tank and did the same thing with the black plastic background. The readings dropped even lower, as the average at the front was 155 µMol·m²·sec. So, the front of the tank, with its simulated painted black background, was noticeably darker than the back of the tank with its painted blue background. In fact, the average PAR was down approximately 34%. Again, this was not what we expected at all. So, we tracked down physics professor Brain Lane, looking for a possible explanation. As he explained, in simple terms, when light leaves its source and hits the panes of glass in the tank, some of that light escapes through the glass, but some is reflected off the inner surface of the glass and heads back into the tank. As strange as it might sound, some of the light also reflects off the inner “surface” of the outer side of the glass pane, too (see the figure below). However, apparently having something “sealed” against the glass, such as blue paint or a wetted blue plastic background stops some of the light from reflecting off the inner surface of the outer side of the glass pane. If anything else was going on, taping the dry plastic background on the tank would have the same effect – but it didn’t. Some light bounces off the inner surface of the glass back into a tank, and some also bounces off the inner surface of the outer side of the glass pane. Yes, that sounds odd, but you can easily see some of the weird reflections created when mixing glass, air, and water. Have you ever noticed that if you look right through the front of the tank it looks clear, but if you look through the end of your tank the front pane of glass looks like a mirror? Take a look now if you’ve never noticed this before. Of course, this doesn’t happen if there’s no water in the tank, as you can see right through the front pane, even when looking at it through the end of the tank. For a different look, I put nothing on the back of this 55 gallon tank and just painted the wall behind it blue. In addition to the background effect, we also noticed another pattern in the numbers that persisted regardless of the type of fixture. The readings were always lower at one end of any given fixture than at the other end, and if you scroll back up and look at the footprints above, you’ll see this. The readings were always a little higher on the left end of the TX5 fixture, and we found that this caused by a difference in bulb temperature from one end to the other. I’ll go into more detail on this in a future article, but for now it’s enough to point out that the 3″ exhaust fan in the fixture was on the right end and it drew relatively cool air from the room into the left end. As the air passed over the bulbs it became increasingly hotter, meaning the bulbs were slightly cooler at the left end of the fixture. Every bulb has an optimal operating temperature, and in this case the bulbs’ output fell off a little at the right end of the fixture due to the increase in temperature. While the end to end differences weren’t drastic by any means, they were consistently there. It’s unlikely that anyone will be cutting holes in a pre-fabricated fixture and/or upgrading the included fans, but if you decide to install a lighting retro-fit kit into a canopy, be sure to use an appropriately-sized fan(s) for the job and give some thought to placing it/them in the top-center of the canopy with vents in both ends. Putting the fan in the top-center and vents in the ends would decrease the distance that room-temperature air travels over the bulbs, and would keep both ends of the bulbs at approximately the same temperature. Okay, let’s get on to how we tested some T-5 bulbs with a single sheet-type reflector that has a single fold down each edge, and what we found. To start, we grabbed our Nova Extreme fixture that houses four 48″ T-5 bulbs and includes a single polished aluminum sheet mounted above bulbs. Then, we covered the entire reflector with black electrical tape. We put the bulbs in, set the fixture up over our testing rack, and fired it up. One little thing to note here is that we waited about half an hour to start taking readings, as we found that it takes a while for systems to warm up and the light output to stabilize. Again, output changes depending on bulb temperature. After everything was ready, we took a series of readings to measure PAR using our meter. Readings were taken at fifteen positions under the fixture, five from end to end and three across (see the grid on the figures below). Note that the bottom of the fixture was approximately 5.25″ inches from the top of the light meter’s sensor. After finishing that up, we pulled out the black tape, got the fixture warmed up again, and took the same series of readings. This let us make a direct comparison between the light that would be going down into a tank with and without the reflector. With the reflector blacked-out the highest PAR reading we got was 191 µMol·m²·sec. We also found that the average PAR was 155 µMol·m²·sec, which was calculated by adding all the readings together and dividing the sum by 15. With the tape pulled off the reflector the highest PAR reading was 435 µMol·m²·sec, and the average PAR was 342 µMol·m²·sec. That’s quite a difference to say the least, as the average PAR went from 155 to 342 µMol·m²·sec! So, it should be quite clear that the use of a sheet-type reflector can make a heck of a difference in the amount of light going from a T-5 bulb to the critters in your tank. Next, we tested our TX5 48″ fixture that houses five 48″ T-5 bulbs with individual reflectors for each bulb. They’re the type that has numerous folds, and have a little ridge that runs right down the middle of the reflector, too. This little ridge is supposed to angle away the light going straight up from the bulb, rather than reflecting it straight back down into the bulb. Again, these reflectors wrap around each bulb to some degree, and we expected them to be even better than the single sheet-type reflector. Note that due to the width of the fixture we decided to use only three bulbs in it, so the readings we got were lower than those presented above. This doesn’t really matter though, as we were looking for the change in readings with and without reflectors rather than the total output of a given fixture. Again, we covered each of the reflectors with black electrical tape, put the bulbs in afterwards, set the fixture up over our testing rack, and warmed it up. We took a series of readings in the same manner, and then pulled out the black tape, got the fixture warmed up again, and took the same series of readings once again. With the reflectors blacked-out the highest PAR reading was 128 µMol·m²·sec, and the average PAR was 101 µMol·m²·sec, which again was calculated by adding all the readings together and dividing the sum by 15. With the tape removed the highest PAR reading was 451 µMol·m²·sec, and the average PAR was 304 µMol·m²·sec. So, we were right to think these would send even more light downwards, as the average PAR went from 101 to 304 µMol·m²·sec! Thus, again, it should be obvious that the use of well-designed reflectors, individual-types in this case, can make a huge difference in the amount of light going from a T-5 bulb down into a tank. So, what about V.H.O. bulbs? Do reflectors make as big a difference? Well, all of the V.H.O. bulbs I’ve ever used had an internal reflector. I assume that’s because they have a larger diameter making it easier to add some sort of coating to half of the inside of the bulb to send all the light in one direction. However, we didn’t do any sorts of tests on V.H.O.s and I’ve never broken one open to see what’s in there, so I’m not positive about that. Regardless, I don’t know of anyone that makes individual reflectors for V.H.O. bulbs. Maybe we’ll try a sheet-type reflector with some in the future though, just to see if there’s any difference. Likewise, the bulbs used in the L.E.D. fixtures I’ve seen always come mounted in little individual reflectors, so we didn’t test any L.E.D.s without reflectors, either. Metal halide bulbs and the reflectors made for them come in a range of shapes and sizes and finishes, but there’s already a good bit of information about these available. Sanjay Joshi has looked at many of them and written up the results in a series of articles (see references below), but what I’ll tell you here is that the right reflector can make a huge difference, and the wrong one won’t help much. So, if you’re thinking about retro-fitting some into a canopy, I recommend you do some homework on bulb/reflector combinations. It is imperative that you use reflectors with T-5 bulbs, and individual reflectors do a better job of sending light into a tank than a single reflector. If for some reason you decided to add some T-5s to a canopy yourself, the data show that you’d need three bulbs without reflectors to send the same amount of light into the tank as one bulb with a quality individual reflector! Also, don’t paint the back of your tank, and make sure that your bulbs are adequately cooled for optimal performance. Joshi, S. and Marks, T. 2003. 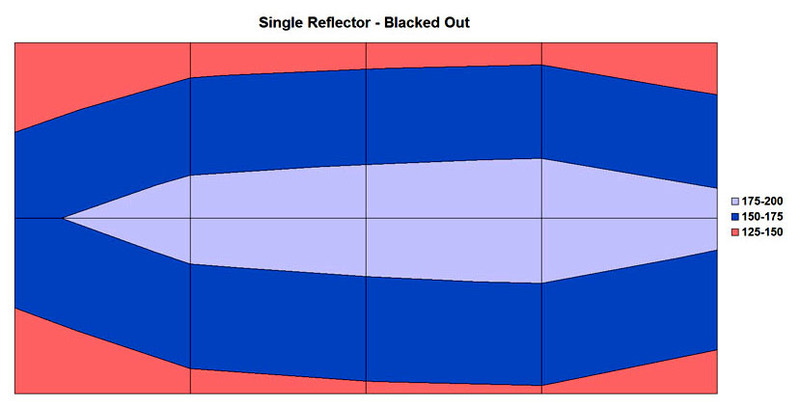 Analyzing Reflectors: Part I – Mogul Reflectors. Advanced Aquarist’s Online Magazine: 2(3). Joshi, S. and Marks, T. 2003. Analyzing Reflectors: Part II – Double Ended Lamp Reflectors. Advanced Aquarist’s Online Magazine: 2(7). Joshi, S. and Marks, T. 2004. Analyzing Reflectors: Part III. Advanced Aquarist’s Online Magazine: 3(3). Joshi, S. and Marks, T. 2004. Analyzing Reflectors: 400w DE Reflectors. Advanced Aquarist’s Online Magazine: 3(12). Joshi, S. and Marks, T. 2006. Analyzing Reflectors: Part V. Advanced Aquarist’s Online Magazine: 5(2). Joshi, S. 2006. Facts of Light Part I: What is Light? Reefkeeping: 5(1). Joshi, S. 2006. Facts of Light Part II: Photons. Reefkeeping: 5(2). Joshi, S. 2006. Facts of Light Part III: Making Sense of Light Measures. Reefkeeping: 5(3). Riddle, D. 2005. Product Review: A Comparison of Two Quantum Meters – Li-Cor v. Apogee. Advanced Aquarist’s Online Magazine: 4(7). Riddle, D. 2008. Product Review: Lighting for Reef Aquaria: Tips on Taking Light Measurements. Advanced Aquarist’s Online Magazine: 7(2).